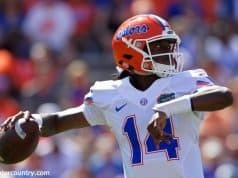 The Florida Gators have had fourteen practices this fall camp but the biggest question they had coming into camp still remains: who will be the starting quarterback when they take the field on September, 1? 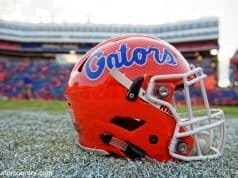 Florida will host its annual fan day Sunday, followed by their 15th practice and second scrimmage. Dan Mullen hopes to know who will be his quarterback, but that doesn’t mean he’s going to share it with anyone other than the team. 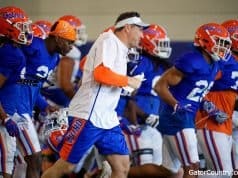 Mullen is looking for consistency, first and foremost, but he’s noticed a disturbing trend among the offense. After years of struggling he sees a weak or pessimistic mentality that’s pervasive throughout the unit. “When we scrimmaged we score a touchdown and it was almost a relief instead of, you know, we expect to do it,” Mullen began. He went on to describe the situation from the first scrimmage. Faced with a first and goal Feleipe Franks threw a pass into the end zone for what would have been a touchdown but it was dropped. Heads dropped and a sense of defeat came over the offense, which was exacerbated when another would be touchdown was dropped on second down. That’s an area where the quarterback can play a huge role. It’s not the quarterbacks fault that the pass was dropped but it is on the quarterback to set the tone for the offense. If a ball hits the ground and the quarterback’s head drops so will 10 others. Mullen is looking for that leadership, that confidence and the consistency to bring both of those every day. Franks started eight games last season and has taken most of the first team reps in portions of practice open to the media. Trask has been dealing with a blister on his throwing hand, which has affected his accuracy. 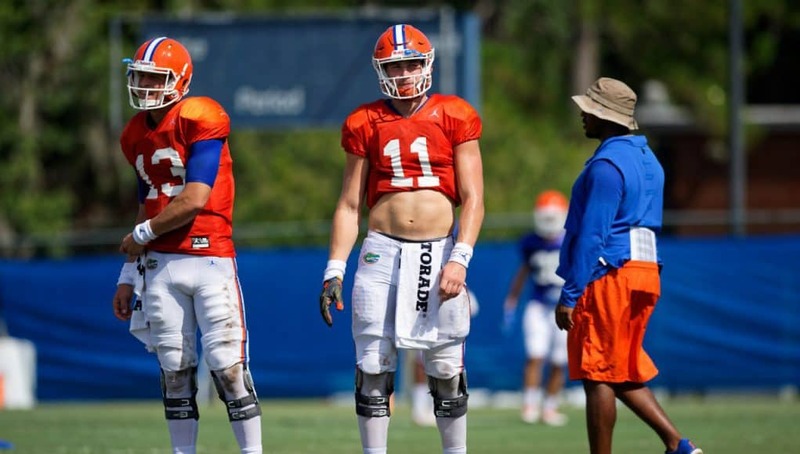 Trask an Franks have both proven to be willing and capable runners, which will be asked of them in this offense, so little things will separate them when it comes to naming a starter. Sunday night that race could be done, even if it’s only privately, but as we’ve seen in the past it’s more than likely that Florida will play more than ne quarterback throughout the season and naming a starter Sunday could be just another test to see where his team is at mentally.